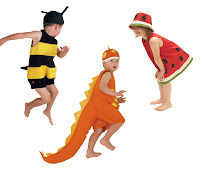 Filiokus - Playful childrens dress up costumes: TRICK OR TREAT! Halloween - 31 October, in early Celtic Ireland the Celts believed that the first day of November was the start of a new season. They called the last day of Summer, October 31st, “Samhain” pronounced “Souen” which is in fact the Celtic New Year. The Celts believed all those who died in the past year would return on October 31st to try to possess a live body so they could enter the afterlife. Not wanting to be possessed, all the villagers would extinguish the fires in their houses to make the houses cold an uninviting and, in addition to this, they would dress up in a ghoulish costumes in order to frighten away the spirits. Over a period of time the practice of dressing up as hobgoblins and ghosts took on a more ceremonial role. The practice of Halloween was taken by the Irish immigrants to America in the 1840’s where the customs were warmly embraced. Here in New Zealand the Halloween celebration is developing more & more. Trick or Treat Bag - free with any purchase over $75. Black, black & more black, pumpkin orange and ghostly white. Use orange card in the shape of a pumpkin. Ghost or Bat shaped invitation. • Don’t forget to ask the guests to dress up. - Anything black or orange - streamers, balloons. - Use Black plastic plates & cups. - Black & orange bunting – use material, felt or paper. - Cobwebs hung from the walls and on the furniture. - Fill the room with black & orange balloons. - Use candlebras, drape cobwebs from it. - Scatter spiders, bats and rats on the party table. - Use a garage or cupboard as a spooky cave. - Carve a pumpkin into a Jack O’Lantern or draw a face on using a black marker. - Hang black & orange streamer from the doorways. - Sparklers are always a hit with older children. Float apples in a large bucket of water. The guests take turns to see how many apples they can retrieve without using their hands. Have plenty of towels available. Warning - children may get very wet. Divide the children into 2 teams. From each team choose a child to be the ‘mummy’. The mummy must stand still with legs together and arms by their side. Provide each team with several rolls of cheap toilet paper. Have an adult as a time keeper calling the turn changes). Each guest has 1-2 minutes (depending on how many guests) to wrap the mummy in toilet paper. The team who completely wraps the mummy wins. Note - Leave mouth & nose visible. 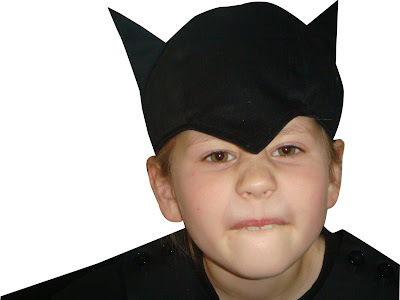 One child wears a blindfold or scary Halloween mask (make sure they can’t see), they have to try to catch the others as they move around the room or lawn making scary, spooky ghost noises. A great game to play in the garage. Tie some string between to walls, trees etc. From it hang a row of Eskimo lollys on string. With hands behind their backs, guests must eat the Eskimo lolly. The guest to finish their Eskimo lolly first wins. Give each guest a sheet of paper and a pencil. Blindfold them or if it is dark turn off the lights. Ask them to draw a spooky house, a bat and a ghost (anything Halloween). Then get them to take of their blindfolds and see what creative artwork they have produced. Display them on the wall or a window. Have 2 buckets of gooey slime with various plastic objects placed in the bucket – spiders, rats, bats, snakes – with some random objects not on the list. Give the guests a list of the items they must retrieve in order. Each guest has a turn retrieving the items on the list – objects must be retrieved in order. The first team to find the objects in order wins. • Large Bowl or bucket. Mix 2x packets of cornflour, green food colouring and enough water to make the gooey mixture. Combine together. Make witches wands or bat wands & decorate. Make ghosts – use inexpensive white fabric cut into small squares. Play dough - Make a batch of orange play dough. 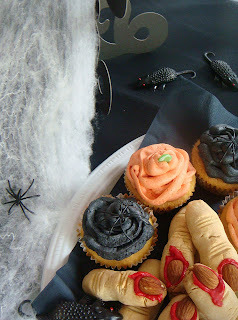 Set it out on a table with Halloween cookie cutters and wooden dowels for rolling. American Hotdogs (finger in a bun). Sausage rolls with tomato sauce (blood). 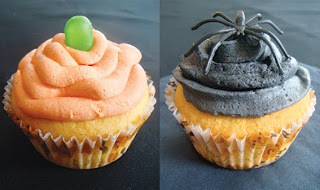 Cupcakes with spiders & bats on top (use plastic toys or use sweets). Cupcakes (pumpkins) - orange icing and green jellybean for stalk. Draw a pumpkin face on a few large oranges and stick fruit kebabs in it. Orange & black jellybeans, orange fruitbursts, orange licorice allsorts, false teeth lollies. Halloween jellies - place snake lollies or plastic spiders etc. Bat biscuts & ghost biscuts (use cookie cutters). 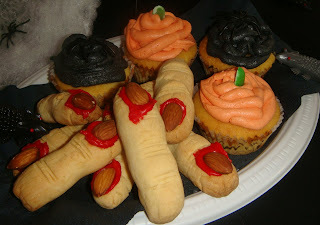 Mummy biscuts - use a gingerbread boy cookie cutter & drizzle with white icing, add eyes. Ghost Meringues – stick silver balls into the meringues for eyes. Ghostly strawberry milk - drizzle strawberry topping down the inside of a glass and slowly pour milk into the glass. Witches brew / Bug juice - lemonade or fanta, ice cream & put in a snake or two. Glue a bat motif onto a bag, plastic cup etc. Use black & orange curling ribbon. 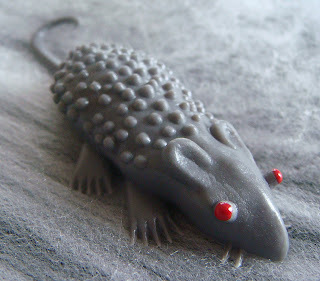 Small plastic bats, rats, spiders, fangs etc. Snake lollies & false teeth lollies. A5 Sheet (laminated) - fun facts about Bats. Use brown lunch bags with stickers. Black paper or plastic cups. 1) Bats bob up & down and seem to tremble. 2) Bats like to fly over flat open spaces. 3) Bats are the only mammals that can fly! 4) Most bats catch their food while in flight. 5) Their wings are made of thin skin that feels a lot like your eyelid. The skin is spread among five long bony fingers – sort of like a big hand. 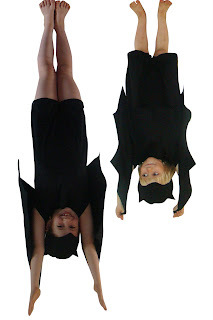 6) Bats knees face backward so they can hang upside down. 7) Bats can detect a tiny mosquito as far as 11 feet away.